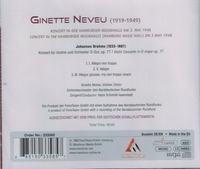 "The legendary French violinist Ginette Neveu (1919–49) is heard live with the North German Radio Symphony in a hallmark performance of Brahms' Violin Concerto in D Major, from May 1948. An absolutely splendid reissue…. Its virtues include a wonderful singing tone, impassioned playing without any rough bowing, and an almost transcendent luminosity to Neveu's phrasing...[and is] even more spacious and, in places, more intense than her 1946 studio recording….It doesn't sound so much as if she is in the room with you than as if you are at the concert hall listening to her play. Seldom has Neveu's sound been captured so realistically, thus for her many fans this should be a must-get item."